The Lady Clarets overcame the main obstacle towards winning the league title and promotion to the FA Women’s Premier League Northern Division One, with a hard-earned win against title rivals Stockport County Ladies. Manager Matt Bee described the team’s performance as “professional and lively” and Burnley Ladies now need just one point from their two remaining games to put the contest out of reach of their rivals. The game was played at the Stockport Sports Village on a bright sunny evening, with a brisk wind cutting across the pitch. Early on there was little to separate the two sides, and precious few chances emerged for either team. Stockport packed their defensive line to block out attacking runs and through balls, hoping to catch the Clarets on the break. In the event, they found they were quickly closed down by Clarets centre backs Jo Holt and Sammy Fleck. Stockport’s best chance of the half came when they forced a corner, and the kick picked out an unmarked player 10 yards from goal, but her powerful header was both high and wide. The Clarets played out to the wings to get around the defensive barricade, Stockport’s defenders sprinting to intercept and made strong challenges. Leah Embley was felled by one and the offending player was booked. The resulting free kick located close to the corner of the 18-yard box was struck across goal by Lynette Craig and initially cleared, before being fed back in by Vikki Eastwood. Lizzy Hamer quickly lobbed the ball over the keeper, but also harmlessly over the bar. In the closing minutes of the half, Embley found space to make an attacking run and shot, forcing a diving save from the Stockport keeper. 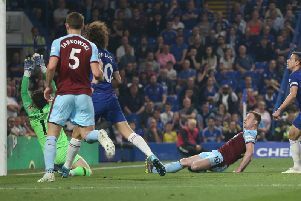 In the second period, the Clarets came out with renewed vigour. Notably Sarah Greenhalgh was playing at speed in and around the Stockport defence. She was quickly rewarded when she received a pass from Embley, and with defenders on both sides, she lofted the ball over the keeper to put the Clarets one goal to the good. Greenhalgh continued to press at the Stockport defence, and they struggled to contain her, especially as they were committing players forward in an attempt to level the score. Lynette Craig fed through to Greenhalgh, who cut in towards goal, but a heroic defender slid across her path and pushed the ball away, upending Greenhalgh. Craig quickly regained possession and shot over the keeper to double the Clarets’ advantage. Stockport restarted from the centre, but Hamer quickly won possession and set Greenhalgh off on another attack, but the ball was deflected for a corner. Captain Jo Holt won the arial battle and headed at goal, but a covering defender managed to head off the line and to safety. The Clarets had further missed chances as Stockport started to work back into game. They won a free kick and struck it from distance, forcing Clarets keeper, and player of the match, Lauren Bracewell to tip over. Greenhalgh continued to press at the Stockport goal and was toppled in the penalty area, but the referee dismissed the appeals. Stockport applyed pressure to the Clarets in the closing minutes. Another well-struck free kick from distance saw Bracewell superbly tip over the bar again, and later Holt was the saviour when she cleared off the line from a late Stockport shot. At the final whistle, the score remained 2-0, and the Lady Clarets celebrated an historic win. On Sunday, the Lady Clarets entertain CMB Ladies needing a point to clinch the North West Womens Regional League Premier Division title.